A great coloring project with dozens of uses. A great coloring project for most ages with dozens of uses. Store markers, colored pencils, drawing supplies, even cosmetics! Great for groups, camps, and rec organizations. 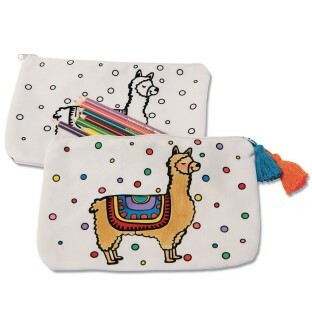 100% cotton zipper-top pouch printed with velvet flocking. Llama on the front and polka dots on the back. Can be tie-dyed or colored with markers or fabric paint. Add glitter, sequins, and gems using permanent fabric glue if desired. Decorating materials sold separately. Measures approx. 9” x 6”.